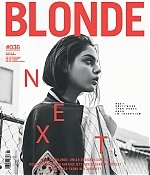 The BLONDE magazine is published four times a year , filled with features, interviews , fashion shoots and news from the fields of fashion , culture , beauty and Movement . It serves as an inspiration for young women with their own opinion . The BLONDE Girl loves fashion and keep your eyes open and sleeves rolled through the world . It is constantly looking for people with good ideas , unusual stories and exciting trends . It always applies : New ways instead beaten track . BLONDE Girls are creative , bold and individual. Check out some recent interviews with Odeya for the UK release of Goosebumps! The up-and-coming Israeli actress, whose credits also include “The Giver,” remains represented by CAA. The first-ever theatrical feature film adaptation of R.L. Stine’s best-selling Goosebumps series hits U.S. cinemas today, starring Jack Black as Stine himself and a bevy of monsters. Can you tell us about your history with the property? Were you always fans? Odeya Rush: My brother is really, really obsessed with them. I knew about Goosebumps from just friends and things like that. I wasn’t always the biggest fan of the horror genre, so I went toward more romantic books or things like that, but now I’m a huge fan. Ryan Lee: I didn’t read the books, unfortunately, as a kid, but you grow up around the Goosebumps name, and R.L. Stine, I knew him for sure. But we got to read them while we were filming, which was cool. Dylan Minnette: I was a very big fan of Goosebumps. I had a very good amount of them and they were a very big part of my childhood. What practical effects monsters were your favorites? Rush: The ghouls. I think they got the people from The Walking Dead, so they were very realistic. The first time they actually started chasing us, I did get goosebumps. Minnette: There was a thing called the Bog Monster, which was really, really cool. I felt bad for that guy in that costume all day, but it was really cool. Lee: There was a clown in the movie — Murder the Clown — who always stayed in character and he was definitely the scariest for me. Primarily I guess for you guys who have read the books, were there any monsters from Goosebumps that you wish had made it into the movie? Minnette: Well, actually, my favorite Goosebumps book is Say Cheese and Die. That’s a hard thing to put in the movie because there’s monsters in the books and there’s no monsters in [Say Cheese and Die]. But there was, in the script, originally an opening sequence that isn’t in the film now that had the Say Cheese and Die camera in it….So I was kind of bummed that that didn’t make it in, but the movie works without it. At this point, the franchise has been going strong literally for generations. What do you think makes it work for people your age, as opposed to old farts like me? Minnette: Yeah, exactly. It never dies. That’s why I’m happy that we made a movie like that now. Was there a moment on set where you actually got scared? Lee: Yeah. We were filming the graveyard scene with the ghouls and we were running away from them. It was Friday the 13th, full moon, and it was pretty spooky. Were there challenges to working with the VFX that weren’t practical? Rush: I think so. I’ve never done something like this before. I’ve done movies where there’s a green screen and you’re pretending to look at a view, but I’ve never done something where every movement you make has to be so specific. So it’s kind of like a muscle that you train; the first few times for me it was just about getting the choreography down and then once you know where to move and how to do it, then you can get into the whole emotional aspect of [the performance]. But once again, Rob Letterman — he’s the reason that anything I do looks good. 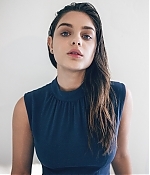 We have added two new photoshoots of Odeya, one with Who What Wear magazine and photographer Nai Jamai, you can read the full article here. The second is the cast of Goosebumps for Parade magazine, here.